John Beard is an important contemporary painter whose struggle to maintain a dynamic tension in seductive images that investigate the structures of representation comes to a head in his recent 'Self-portrait' series. I believe this series begins with a large number of studies of an isolated rock off the coast of Portugal made while Beard was living in Sintra, near Lisbon in 1993. This rock, surrounded by sea in all its moods, seemed to entrance him for several years. In the 'Adraga' series it first became clear that the rock had become a figure or a head. John makes no concessions to mimetic suggestions of anthropomorphism, it is simply the intensity of the focus on the singularity of the form that makes an inanimate rock into an identity. In recent years he has made a number of portraits, mostly of himself. The heads fill the canvas vastly bigger than life, but curiously not monumental in the sense that large-scale political portraits can be with their assertion of dominance. The paintings have great presence, but the imagery has been layered over and over with scumbled screens of paint so that the image is almost invisible. At their best the likeness seeps out at you almost like something seen in the dead of night. It looms up at you then recedes. In part this is a kinaesthetic effect of light on the surface that requires the viewer to move with the work and the direction of the light. They are more alive to variations of lighting than most pictures I have seen. Beard is a painter of the late 20th century whose subject is as much painting itself as the objects he renders. In the history of portrait painting there is a fascinating debate that goes back to the mid 19th century. This is the question of authenticity of the image. It is not an issue of faithfulness to the illusion, but to a kind of presence that is realized through the facture of the work. For example the processes that compound our awareness of the paint as material and how this might function as a metaphor for the primordial matter out of which consciousness arises. This expression of process and touch also emphasizes the close proxy presence of the sitter to the viewer [Paul Barlow describes this process in his discussion of Watts and Millais in an essay on the National Portrait Gallery in a book of portraiture edited by Joanna Woodall at the Courtauld Institute London]. When Beard manipulates the image and the viewer into a dance with the light he is pushing this tactility to new heights. Contemporary practice and theory 'complexifies' the very idea of authentic and in-authentic as exemplified by Richter, and it is here that Beard comes into play. The manipulation of viewing positions between the painted surface and photographic incident may be seen as deconstructing simplistic notions of authentic experience of pictures; however it seems to me to bring the viewer back to greater consciousness of the visual and tactile effects of images as objects. There is a modern trajectory from this such as the 'Number' paintings of Jasper Johns. 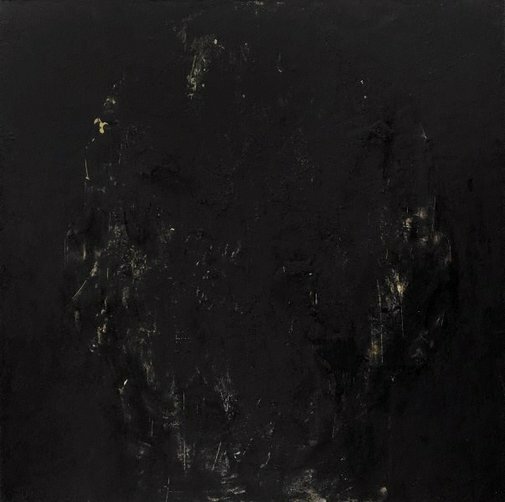 These works attract our attention by their heavy impasto and promise revelations of meaning through the numbers, but finally offer nothing but a return to the quality of the surface, hence a return of the gaze to self consciousness [Ian Burn noted this of Jasper Johns in an exhibition catalogue, "Looking at seeing &​ reading" for Ivan Dougherty Gallery, Sydney 1993]. Since the mid 90s there has been renewed interest in a kind of authenticity most noticeable in relational aesthetics, concerns with contiguity and the index, and particularly in the appearance of narrative in film/video where an attempt is made to evoke the immediate, the everyday and the intimate. While Beard's use of film/video with his paintings may be rudimentary in engaging these processes, it seems to me to provide a very useful pivot for prizing open these issues and significant opportunities to explore important propositions about the role of painting in the 21st century. Signed and dated c. verso, black fibre-tipped pen "JBeard 96-2000". Stephen Bann, Anthony Bond OAM and Charles Saumarez Smith, John Beard , Neutral Bay, 2011, 214 (colour illus. ), 317 (colour illus. ).